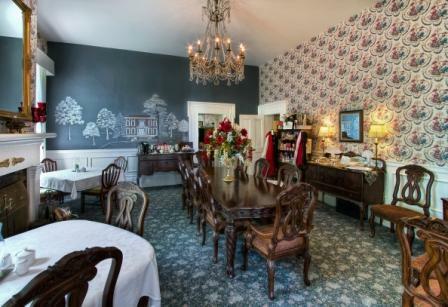 The centerpiece of this beautiful, elegant dining room is a mural that was hidden under wallpaper for many years. The mural depicts the house as it appeared in 1851. We can comfortably seat all of our guests around the main table as well as 2 side-tables are available for a more intimate preference. An over-sized wood-burning fireplace provides a warm glow and romantic ambiance during the late Fall and Winter months. Our crystal and china breakfast setting provides a delicious, memorable dining experience. An award-winning, Full Country “Gourmet” Breakfast is normally served between 8 a.m. – 10 a.m. unless other arrangements have been made. Continental Breakfast is available before and after this time frame, however pre-arrangements must be requested prior to the Guest’s arrival. We are happy to address special diets, including Gluten-Free and Sugar-Free requests, and any food allergies or unique likes/dislikes – please indicate that at the time of making your reservation. We feature locally grown and Kentucky Proud ingredients wherever possible – for that extra fresh flavor and true taste of Kentucky! Dessert & Coffee each evening – there is no set time for this service and is available to our Guests throughout the late afternoon and evening…a wonderful way to get to know the other Guests staying at the Manor! Beverages are complementary and always available such as iced tea, lemonade, bottled water, coffees, selection of teas, cocoa, etc.